UNI-SOLAR award winning roofing products are the key components of a total solar electric system. 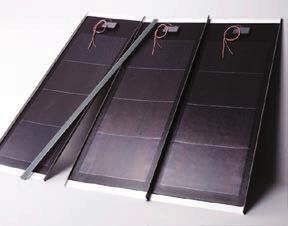 The system integrates the solar electric roofing panel or shingle with the necessary combiner boxes, inverter, and wiring to convert sunlight into electric energy and distribute it directly to the building. 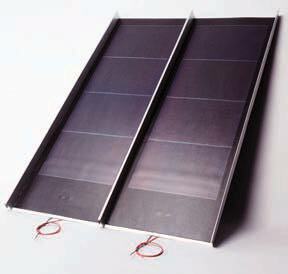 The solar electric roofing products are configured in series or parallel on the roof deck to form an array. The array is then used in combination with conventional roofing products. United Solar's new PV shingle permits roofs of commercial and residential buildings to evolve from mere weather protection using regular roofing shingles to a source of electric power. The flexible thin-film shingle blends in to the roofing pattern of traditional asphalt shingles. 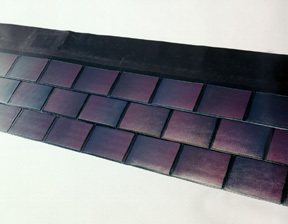 United Solar's Architectural Metal Panels are building integrated photovoltaic panels. They are reliable, attractive, and cost-effective design options for creating sustainable and energy self-sufficient buildings. Aesthetically-pleasing, solar architectural roofing panels are integrated into the roof following the specifications of conventional architectural standing seam panels. United Solar's Structural Metal Panels combine the appeal of a structural roofing product with the solar electric capabilities of PV. Designed for ease of installation, this solar panel is integrated into the roof following the specifications of conventional structural standing seam panels. System design and installation are made based on user needs.